Gee whiz, Robert Burns' famous quote was never more true for me as it was yesterday. So I get home yesterday after work, with a pretty good headache, but ready to tackle the pumpkin pie-"the easy one," I'd been told/read. I'm all excited to puree my own pumpkin. Had read all about it here. Well, right about this time, after I got the pumpkin in the oven, I noticed that the kitchen ceiling was leaking. Like more than just a drip. Had to move the trash can underneath, it was a steady drip-stream. I look up, and the ceiling is discolored from water. 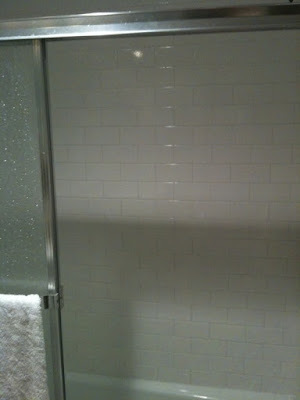 So, we're all excited about our new clean and fresh shower, thinking we've got the ceiling leak stuff behind us. This was not to be. I've got the trash can under the leak, thinking "PIE WEEK MUST GO ON!" Jonathan calls the contractor who coordinated the new shower tile job, Donald Robbins (who has done some projects for Grant & Mandi too). Donald happened to be in the neighborhood, so he comes over and takes a look. Yep. He had to cut a hole in the ceiling. Right over my kitchen island/counter/primary pie workspace. Today's update: they're getting it fixed and the problem has been identified. Also note that this issue is completely separate from the shower re-tile job and no fault of anyone but a worn-out shower knob/nozzle thingy. Thanks, Donald, for coming over on such short notice! You're awesome! Pie week must go on. I pack up a box of baking materials, reviewing my recipe, and relocate to Martha's house. Here, I had a new supporting cast member. GIBSON! Yesterday, I had the brilliant idea of making one pie with freshly pureed pumpkin and one pie with canned pumpkin, to see if there really is a difference between them, and which one is actually better: Once and for all. The same recipe was to be used for both pies: the only difference was pureed pumpkin versus canned pumpkin. But first, back to the task at hand: pureeing my pumpkin. Batch #1 was with the fresh pumpkin puree. Remember nutmeg I grated from Day 2? I had no idea what was in side these buggers. eeewwww this gives me the willies! eeeeeek! More pie weights! I used the Martha Stewart Pate Brisee for the fresh puree pumpkin and the Crisco/Pioneer Woman crust for the canned. The canned pumpkin pie is much prettier than the freshly pureed pumpkin pie. Now for the blind taste-tester, Nick. Which tastes better, Nick? Nick's verdict: he prefers CANNED pumpkin pie is better. Then, I went over to Lori's [my pie mentor, cook/caterer extraordinaire]. She was in the FRESH PUREED pumpkin camp. Here's my take on it: This recipe, when using canned pumpkin pie, produces a pie just like every pumpkin pie you've always had. Now the fresh pumpkin produces a pie with a fluffier texture, bringing more of a custard-y taste which highlights the eggs. It's "different," if you will. Fascinating. But really, for the trouble it is to puree your own pumpkin, I'm not sure the taste/texture distinction would always be worth the hassle (can I even say that???? Pioneer Woman and/or Martha Stewart would most likely disagree). It's not "hard to do," per se, just a real hassle. Roll out pie dough disks to 1/8" thickness. transfer to pie pans, line with parchment paper, and fill with pie weights or dried beans. Bake pie shells 15 minutes at 375 degrees. Remove pie weights and parchment and bake another 15 minutes. Cool on wire racks. Mix pumpkin, brown sugar, cornstarch, salt, cinnamon, ginger, vanilla, nutmeg, eggs, and evaporated milk; whisk until combined. 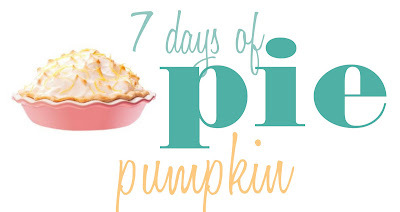 Place pie shells on rimmed baking sheets; divide pumpkin mixture between pie shells. Bake until all but the centers are set, 35-45 minutes (mine took closer to 55 minutes, easy). Let pies cool completely on wire racks. Serve with whipped cream. 3 days into Pie Week and all pies have taken longer to bake than the recipes state(d). Thanks, Marth, for letting me come over and play with your kitchen toys. And thanks to the cutest puppy Gibson for his help in the kitchen. Where will this adventure continue? I know not. Who knows what will fall from the ceiling to try and stop me. But rest assured: The Sleuth will not be stopped. I think your helper for pumpkin pie is the best helper on the block, and cutest, might I add. He told me after you left he was sad you didn't let HIM taste test. You can come cook in my kitchen anytime and we'll be your taste tester... please please?? If you need to relocate again, I'm right around the corner! 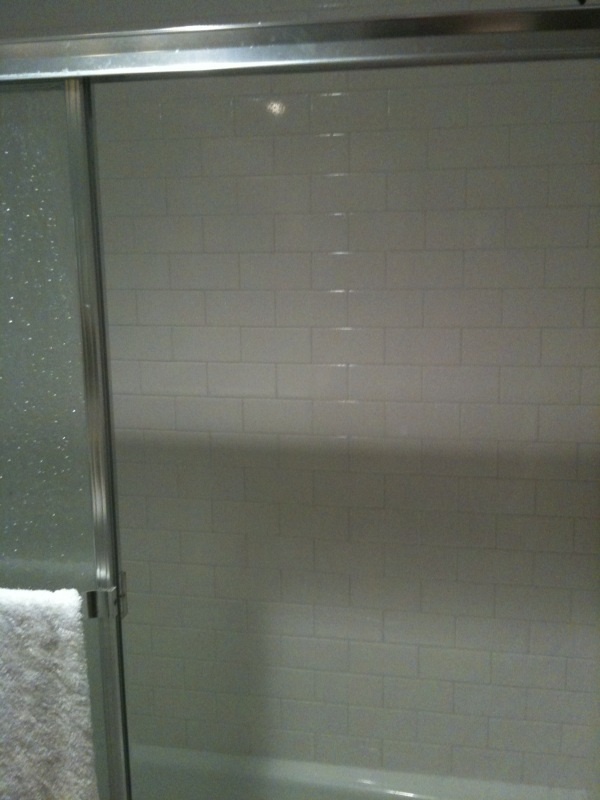 The bathroom tile looks great! Donald is always so good to come to the rescue. And, you're totally due a pie day with no glitches! Maybe it was today!? I've been intrigued by this whole "pie week" thing. I've wondered to myself if before children would I have attempted such a thing...probably not. I'm thinking I would have read a book or something. But kudos to you. Oh, and my 5-year old has been asking about pumpkin pie lately. He asked why I haven't ever made one. My response: "Why would I make one when I can just go to Costco and buy a GIANT one for $6?" Oh, and I'm glad to see that you are sharing these pies with others because I was not quite sure how "pie week" fit along side of half marathon training.